To create support and provide peace for those touched by pregnancy or early infant loss; to create a safe haven to grieve and to heal; and to educate and advocate awareness around the needs of mothers and families experiencing such a loss. To change the way the world views infant loss by providing ongoing support that serves the emotional, physical and spiritual needs of grieving families. To create support toward positive resolution of grief experienced at the time of or following infant loss. To provide ongoing care and support throughout the months and years that follow. To redefine the medical community's response through information, education and resources. To aid those in the community, including family, friends, employers, members of local congregations, caregivers and others in their supportive role. 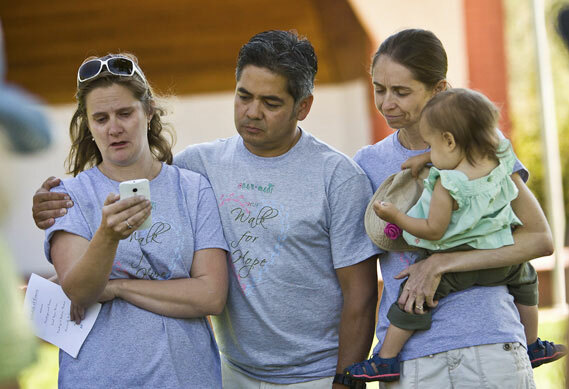 In connecting through personal loss, Marcia Villarreal and Amanda Emerson started One Moment in hopes of creating a network of support and awareness in the valley centered on pregnancy and early infant loss. Marcia and Amanda, Roaring Fork Valley natives and former Carbondale neighbors, re-kindled their childhood friendship in 2010 after the loss of Amanda's baby girl, Ceiliedh Madison, at 22 weeks gestation. Amanda discovered during the routine 21 week ultrasound that Ceiliedh had developed Amniotic Band Syndrome and Limb Body Wall Complex and would not survive. She had to say goodbye on July 2, 2010. This loss had a profound affect on Amanda and turned her personal loss and tragedy into the desire to support others through such losses that are so typically ignored by today's society. A year later, Skyelar Brie was born in 2011, her beautiful rainbow baby delivered into this world by way of home water-birth. She has recently welcomed her son, Zebulon Hawkins into the world as her second rainbow baby. She is forever a mother of three, aand grateful for the journey from loss and tragedy to joy and happiness. Marcia and her husband Gil have lost four children through miscarriage. After having their first child in 2004, Lucas John, Marcia suffered their first miscarriage in 2006. Her next pregnancy in 2008 brought Ethan Rae into their family. Marcia and Gil were excited with their next pregnancy in early 2010 but an early ultrasound at 12 weeks revealed no fetal heartbeat. They were shocked and disappointed beyond belief. Marcia suffered another miscarriage later in 2010 and their most recent in the summer of 2011. Then in September of 2012, after much holistic efforts to bring Marcia to optimum health, they conceived again. This journey was to be different, a light at the end of a dark tunnel. In June of 2013, Emma Rose, their perfect and healthy rainbow baby was born. Further knitting the bond between Amanda and Marcia, Emma and Zebulon were born on the same day, brought into this world on the wings of faith, hope, and love. With this legacy, it has been Marcia's desire to turn her tremendous losses into the most positive thing she could – helping and supporting other women who go through the pain and grief of pregnancy loss. It is our desire to bring healing and hope to families affected by pregnancy and early infant loss. We hope to help others see that there is joy on the other side of the deep valley of loss. in memory of your baby(ies). Thank you for helping us spread healing and hope!